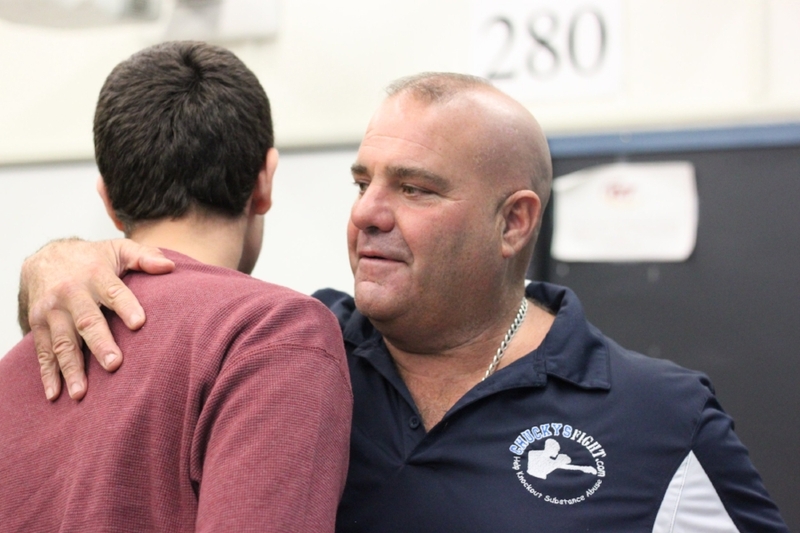 Ninety students met with public speaker Chuck Rosa today, who shared his family’s tragic story surrounding addiction to teach his audience about the dangers of drug and alcohol abuse. Rosa, who is in recovery for alcohol addiction, met with students in four small groups to speak about his two eldest sons, Dominic and Vincent, both of whom died from drug overdoses in their 20s. The Seabrook, N.H. father founded Chucky’s Fight, a nonprofit organization dedicated to helping those struggle with addiction get the help they need to recover. Part of his work includes visiting schools and youth organizations in an effort to make a difference through awareness and education. Every morning, Rosa began, he jumps in the ocean near his home where his sons’ ashes are scattered, to start the day with them and ask them for their help and support with remaining in recovery. Dominic and Vincent, Rosa explained, started using drugs before their 15th birthdays and later died less than a year apart at 21 and 20 years old, respectively. “If you think for a minute you can be that guy or girl who is above using drugs and getting addicted," Rosa said. "My boys were like that, too." At the end of Rosa’s talk, students stood up in a circle and pledged to make healthy choices. Rosa then gave participants dog tags they could keep with them to be reminded of their commitment. Today’s presentation is part of Whittier’s Above the Influence Campaign, where advisers from both Whittier and Haverhill High School bring programs and activities to students to educate them on the harmful effects of drug and alcohol and the importance of making healthy decisions. In September, students had the opportunity to participate in an essay contest about how they or the community have been affected by things like drugs and alcohol. They were asked what advice they would give to their younger selves, knowing what they know today. Two winners from each grade, along with two seniors from Haverhill High School who also participated in the essay contest, earned a lunch with Rosa and listened to his morning presentation. All students who submitted entries, along with others who the guidance department identified as having someone who may have a loved one struggling with addiction, also listened to Rosa's story. Juniors are Spirit Week CHAMPIONS!